Thanks so much for your responses to my call for questions in the Whatdya wanna know? post. It is so weird to talk about myself this way..its like a really fun job interview without the job. But lets get down to the nitty gritty. I'll start with the easy ones first and move on the more complicated answers in a future post. Jeremy and Kathleen asked... Do you drink alcohol? Yes, I do drink although not that much. I don't have a moral objection to it, I just never acquired much of a taste for hooch. I'll enjoy a cocktail on occasion, its not something I would consider a serious pastime. Brand New and Beautiful asked...What do you do for a living? thestamfordwife said... I'd like to see one of those "10 things I can't live without" posts from you. It's funny you mention this because I just finished one of these 10 things list for another blog. The lovely Paloma of La Dolce Vita invited me to participate in her series so my answers will be appearing later this month. Ill let you know when its up. felix said... I would like to hear more about your travels. Have you been to Japan? Yes, I've been to Japan once. We spent a long weekend in Tokyo last year and I blogged about here. You can read more of our trip reports by looking at the box I've added at the right hand side of the page. StellaSmithDesigns said... Thanks to your links I just read that you spent your 30th in Paris. I'm planning a trip there for my 30th as well in October. Do you have suggestions for restaurants/hotels/must-dos? When we went to Paris, I wasn't posting non house stuff on the blog. Obviously that all changed last year but I did post a flashback of our Paris trip. I am quite far from an expert but my suggestions would be to: visit at least one of the big flea markets if only to browse (prices are really high), stop in La Dureee to oogle at the macaroons, enjoy being a tourist in Montmarte and visit the amazing taxidermy displays at Deyrolle. Writing this is making me want to go back now!! Its an amazing city no matter what you do - you'll enjoy yourself. Tearing Up Houses asked do you and mr. limestone plan on being at your current pad indefinitely? In a word, yes. We have no plans of moving ever. Obviously we don't know what life has in store for us so anything is possible but we hope to be in the limestone for the foreseeable future. Linda at Lime in the Coconut! said... Best bagels in Brooklyn? My favorite bagels just happen to come from a shop a few blocks from my house - Terrace Bagels. But its a little out of the way for Brooklyn visitors so I would recommend another place called La Bagel Delight which is just as good in Park Slope. You can read more about my favorite places to eat, shop and see by reading my Pocket Guide to Brooklyn. Lavender and Lilies said... Have you lived in NYC/ Brooklyn your whole life? Another easy one - yes, we've lived in Brooklyn our whole lives. We both grew up in the area and love Brooklyn so we stayed. Naz said... Do you work from home or do you go to an office? As much as I would love to work from home, that isn't in the cards. I get on the subway with the millions of other commuters and make my way to a drab office everyday.  PhillyLass said... Is your limestone considered a historic property? Nope, nothing historic or important about my house. Brooklyn has lots of landmarked areas but I am not in one of them. Valerie said... what does the outside of your house look like? what are the dimensions of it? My house is the one with the black painted awning. Its approximately 20 feet wide which is the standard for homes like mine. Ok, thats about it for the easy ones. You've given me lots more to answer so I'll be back with those. And if you want to add more to the pile, feel free. I love posts like this. Thanks for the little peek into your life! OK, I think I e-mailed you this, but I"ll put it into the mix...have you considered designing as a living? I hate to think of you in a drab office everyday. And, of course, my other question is...can we be friends? this was a fun read...looking forward to more! I love that picture of the exterior of your home! what color are your window frames exterior and interior (black or brown)? Are they new? If so what material (wood or vinyl)? Just think they are so cool but never really heard you mention them. Lastly, when you moved into your neighborhood, was it a transition neighborhood (or up and coming neighborhood, run down, etc.) or was it a well known expensive area (thinking Lincoln Park in Chicago)? Also, have you visited Chicago? Ok, I've got one: why was your home in such bad shape when you bought it? Was it formerly a bad neighborhood? Yankees or Mets? That includes Mr. Limestone's answer too, if you don't mind. This is a silly question, but it's something I've been curious about for awhile. When you first moved in, I believe the top floor was being used as a rental, and the bottom two floors were used as the main house? So how do/did all those floors connect? Did the renter have to go through the main house to get upstairs? And do your in-laws have a way of getting upstairs without having to go outside? Here's my question: Do you and Mr. Limestone ever bump heads over renovations or decor choices? What's the best design compromise you've made together? My question is, how/why did you start blogging? and how did you start getting recognition/followers? You're not as predictable as you claim!! I'm loving this! HAHA, I love it!! Oooh, now you've got me thinking, seeing as I come here all the time as my inspiration for NOT throwing in the towel, I must ask - was there ever a point where you just felt like, "THAT'S IT, I GIVE UP!" and what happened/what did you do to keep on keepin' on?? i still take your email about home renovations to heart..thanks again for taking the time to send that email off. What a fun post! And if you answered you would be moving at some point in the future, at least a few inquiries would be headed your way about when and make sure to call me first! fun! i love learning more about my fave bloggers. okay -here's a question. to me, you have a very timeless classic interior design style. can you post a pictures of a room (from a design mag or some other source) that people like myself might be surprised to know you adore? perhaps it's super contradictory to how you've designed your own home or just stands out to you for some reason. & tell what you like about it! Pieces of mail and magazines- I never know how to organize or where to keep them- what's your approach to your mail/magazines- and do you use any organizational tools to help? I love these little glimpses into your life. I think we are all so interested to see what someone with so much talent (obviously) does in the day to day. My question would be where is somewhere you would like to visit but have not yet? Thanks for the peak inside our life. I look forward to tomorrow's installment. Loved your post! So, I want to know have you ever considered hosting a get together of your fellow local bloggers? Not at your home but somewhere there so that you could get to know some of your followers? If I lived there I would have already asked to meet you, ha! You truly do seem to be an incredible person and anyone would be lucky to call you their friend! Hugs from Conroe, TX! Thanks for answering those fun questions. I love the outside of your house. So jealous you went to the Budapest wine festival! That would be amazing! Hi! I found your blog a few weeks ago. My style is normally more modern, but I love your home. And I'd totally give you an award for "best pictures". Your pictures are gorgeous. What camera do you use and do you process the images in Photoshop before publishing them? Hi! Just wanted to say how much I love your blog. I too am a remodeler and have been working on my house (with my dad) for about seven years. You have inspired me to organize my remodeling pictures and post them...sadly I have been working on my house so long that some of my film is on 35 mm... qué horror! Hopefully I will get them all together soon! Amazing! I really wanna go to Japan. I have a great time reading your blogs.